Experience "Doubt" at the Tybee Post Theater! In this brilliant, powerful and timely drama, Sister Aloysius, a Bronx school principal, takes matters into her own hands when she suspects Father Flynn of improper relations with one of the male students. 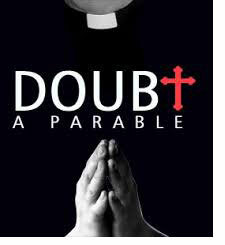 DOUBT is a gripping story of suspicion cast on a priest's behavior that is less about scandal than about questions of moral certainty. February 1, 2 and 3, 2019. The Savannah Murder Mystery Dinner Theatre- There are no current performances. Click here to sign up for our e-mail announcement list. You'll receive regular (but not too many!) announcements about our upcoming season, special performances and theatre events.